I am one of those horrible Americans that does not put much thought into the meaning of any holiday aside from Thanksgiving and Christmas. Turkey Day is when I overstuff myself with fixings and fowl with my pal, Martini Max, and his family. Christmas is that time of year when I play freeloader with my own family on the West Coast. The rest of the holidays I’m here in New York so that means I’m busy with my other preferred activities, sleeping in, not doing much and taking a break from my usual dull breakfast at The Grind. 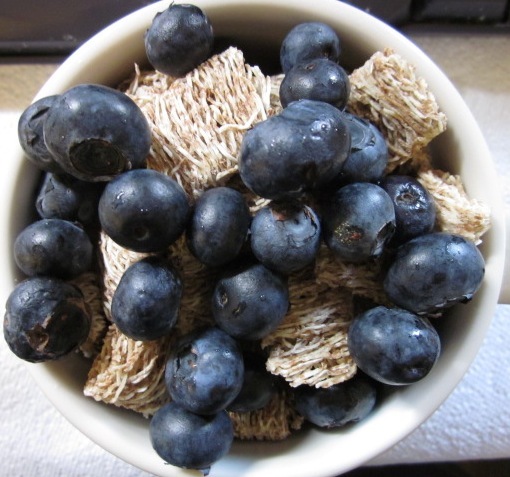 Squares and blueberries. Not quite the dullest breakfast ever but in that neighborhood. My Memorial Day weekend started with getting released from The Grind early so I pounded a few brews with my sidekick, Greg, and it will end tonight when I pound more liquid joy with my bud, Milton. Greg and I had private Greg and I talk including some shared observations about the anatomy of fellow patrons, his frustration that the men’s room line was so long, and why did two guys exit together? Our shared silence about that was our answer. Any mention of the armed forces was not on our radar. It’s possible that Milton might mention how much he adores men in uniform passing through town since it’s Fleet Week out here. That’s one way of paying tribute to the soldiers serving overseas on our behalf. 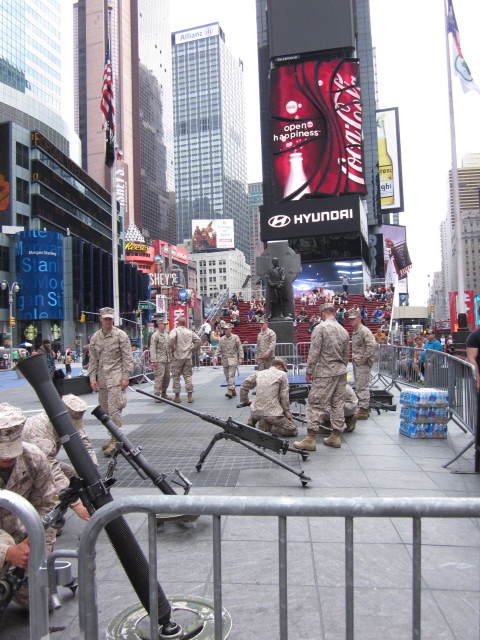 Last year when I was in Times Square to purchase theater tickets for Milton and I to a play, I saw three Marines, two men and a woman. They were young officers and seemed rather genial so I sniffed the scent of camaraderie. I liked that. They had a theater ticket discount and were trying to purchase tickets to a musical that was not sold out and available for the time they wanted, but there was some problem so they were denied seats. I felt outraged. I did nothing about it other than I called Milton and groused. He shared my outrage. The way we see it, you go someplace halfway around the world, you risk your life for God knows what, and then you get a pass to hang out in The Big Apple for a few days before returning to the danger zone where you might end up maimed or dead, you rate perks. Even if I have questions about the validity of the wars we’ve been fighting or fought, people willing to participate in them are okay with me. When they’re in my town, if they want to see dancing and hear singing, let them and let them have a great dinner, too, on my tax dollar. 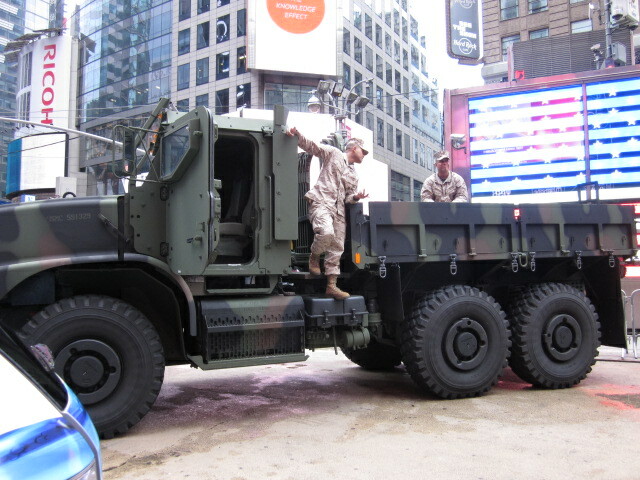 While I was in Times Square this weekend, the Marines were conducting demonstrations as a recruiting tool. I took pictures but didn’t ask questions. I hope these troops at least got paid overtime. 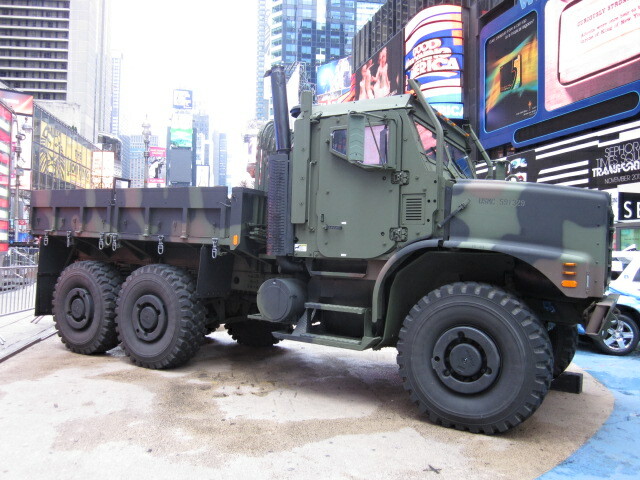 Marine climbing out of Real Big Truck. I’d probably sprain an ankle doing this. 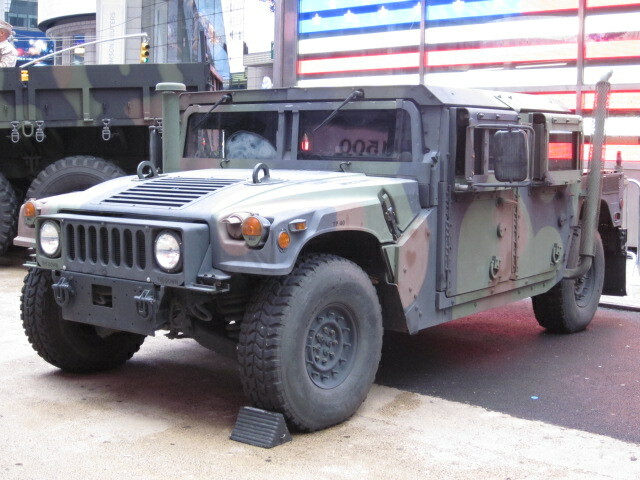 Big Long Hunk of Many Wheels (probably what the Pentagon calls this vehicle, too). Looking down the snout of the Big Long Hunk of Many Wheels. Snout of Big Long Hunk of Many Wheels I nearly walked into. That would have hurt. 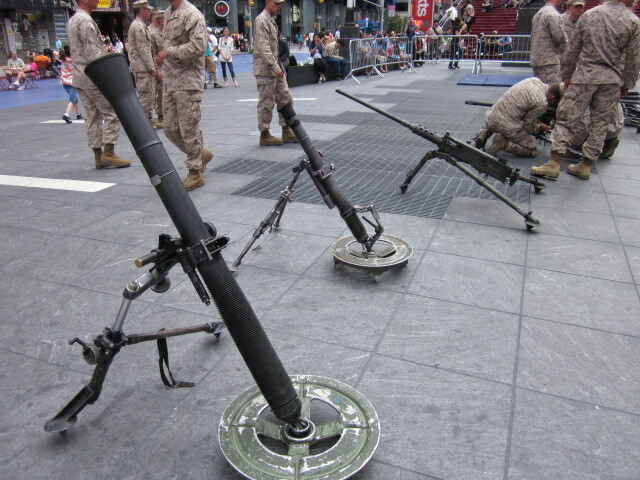 Marines setting up show and tell in Duffy Square. 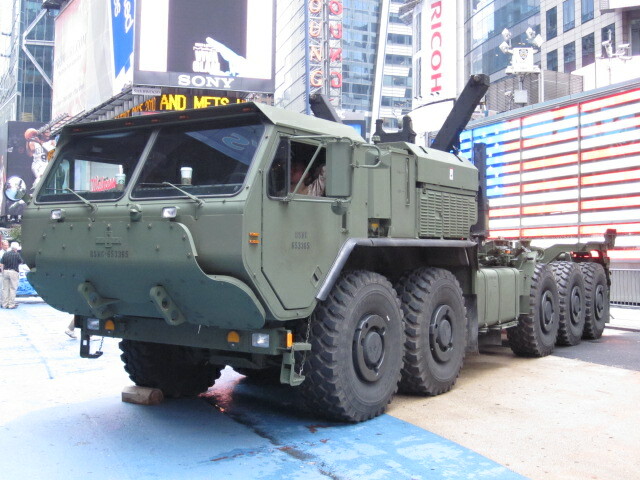 Seeing rocket launchers in Times Square is a bit surreal. Uncle Mickey Sam aka it must be hot as hell in there. 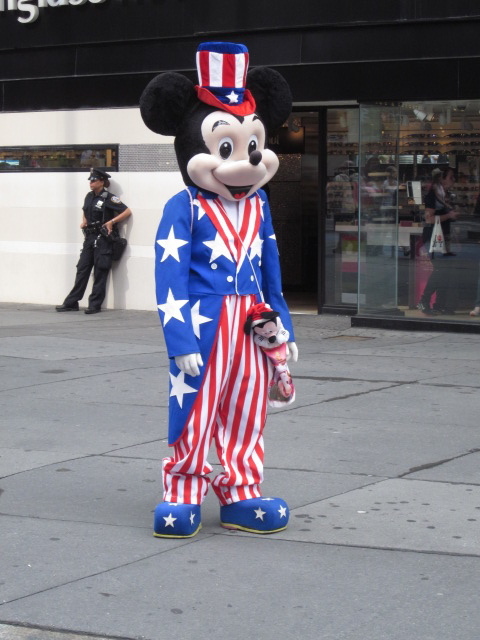 This entry was posted in holiday, Humor, new york city and tagged memorial day, mickey mouse, times square, us marine corps. Bookmark the permalink. Great pics, VA! 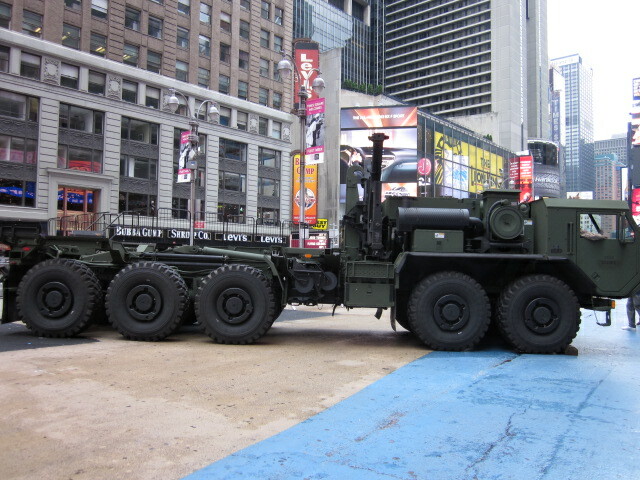 You’ve chronicled this historic meeting of two great American icons – the U.S. Marines and Times Square – brilliantly! Thanks Mike. I was there before the herd arrived so that helped. Ha! I love what you call the vehicles. If only the pentagon would use the same language. If I were to try getting in or out of Very Big Truck, I’d not only sprain my ankle. I’d break my neck, as well. For sure. Now, that would be a lame adventure and then some! Yikes. 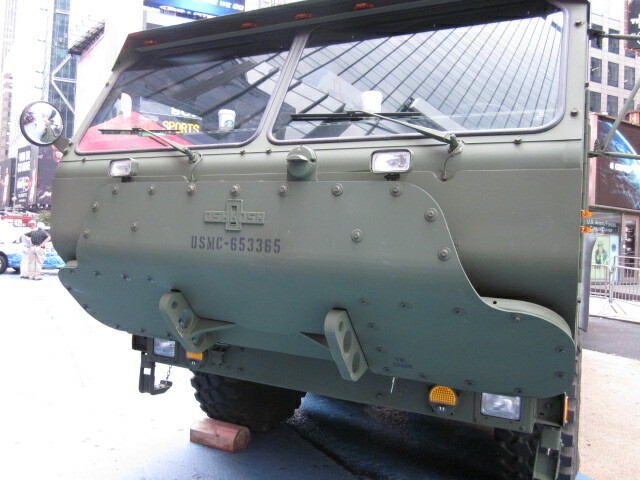 Hm, Pentagon Vehicle Namer … my true calling in life? Happy Memorial Day to you, too, Kathy! Love the pics! And I would definitely nominate you for official U.S. Military Vehicle Namer. Considering your credentials as a historian that really knows your stuff, I feel very honored Madame W! Uncle Mickey Mouse just isn’t right without the giant hands too. Plus, it appears being near rocket launchers and artillery makes him much too happy. The other Disney characters might ought to be worried and also be certain not to make Mickey mad. You wouldn’t like Mickey when he’s angry, especially with those normal sized hands that could easily use some of those small arms. Excellent observation about Mickey’s mitts, Dan! There was another Mickey in trademark Mickey red & black attire, or maybe it was the same Mickey just being a quick-change artist. My critters of choice have always been a wild hare named Bugs and a coyote called Wile E.
Good thing that smile is painted on Mickey! I agree about making sure the men and women who serve our country are given some kind of priority. Well said. I used the term “grind” in my post too! Great minds think alike or maybe I subconsciously ripped it off from one of your previous posts! Hahaha! Whenever I see people dressed in full cartoon character regalia, it reminds me that there really are worse gigs out there than the one I have. At least I work in an air conditioned environment and I’m not required to wear a big head (yet). Hm, did you subconsciously rip off LA’s use of “grind”? Naaaaaaaaa, you’re probably just infected with my blatherings. They’re about as common as a cold. Always good to hear from you Susie! Last year, when I was working the booth at the Meridian Speedway on Military Appreciation Night, I got to see one of their humongous tanks – something as large as a planet, mind you, crush a car. Just drove right over it and crushed it like a pancake. No one was in the car at the time. Just good, clean family fun here in Idaho! If they did that here in NYC, they’d probably have to shut down Times Square as if it were New Year’s Eve, the crowd would be so massive to see that demonstration. Crushing a car with a tank has crowd pleaser written all over it. What a good time to be in Idaho! I am not sure those final 8 words have ever been penned by an NYU film grad. Unless, of course, Papa was an NYU grad. I can only imagine what Gertrude Stein would have said. What final 8 words are you referring to? Nope, Pappy Lame was a graduate of the College of Hard Knocks. “What a good time to be in Idaho.” Wasn’t referring to your dad, but the heretofore most famous resident of Idaho. Who’s that? I’m not as informed about Idaho as you Mike. Papa aka Ernest Hemingway. Contemporary of Gertrude Stein. I think he literally bought the farm in Idaho. Again it is me without the last initial. Had just turned off the computer and responding via phone where I am more mobile yet less fully identified. Yes, Mike, I know you’re you with or without the initial. Yep, he bought his rainbow in Ketchum in 1961. When we were just 2 years old and already writing in more complex prose! Little did we know that it would all be downhill for us from then.